This was by far the coolest pour I've ever seen. I wish I took a video. From the bottle to the glass there were three colours: the black at the bottom, a glassy middle that looked like beautiful pearls, and the top head. The top and bottom both rushed towards the centre like they were magnetically attracted. Well I'm attracted. 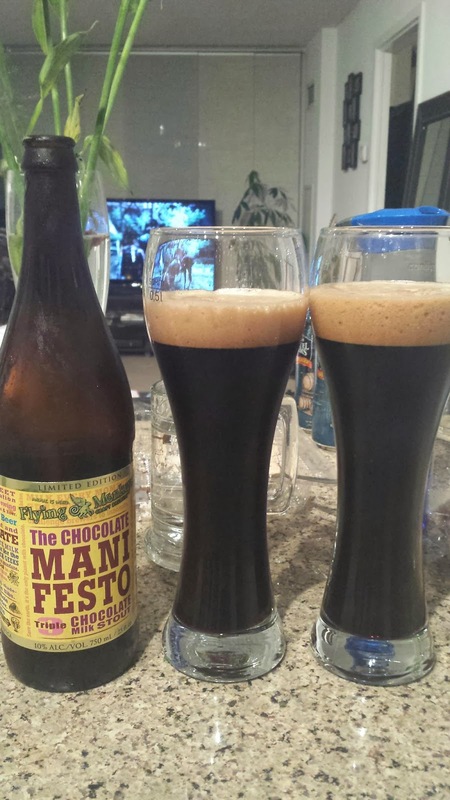 The limited edition Flying Monkey Chocolate Manifesto Triple Chocolate Milk Stout is 10% alcohol and 100% chocolate milk deeeelicious! Creamy, like a Sam James coffee, chocolaty like a Godiva truffle, and just slightly bitter to let you remember you're drinking a stout. Try this. Please. It's rich, so have it after a light dinner as a delectable dessert. Maybe alongside a creamy strawberry cheesecake. Mmmmm.